Published in 1994; 261 pages. 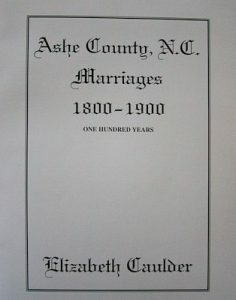 Abstracted by Elizabeth Caulder from records of North Carolina State Archives and Ashe County Register of Deeds, beginning with the formation of Ashe County. A separate index is provided for bride names and for unrecorded marriages evidenced by marriage bond records. On Sale! Was-$68, now only $44.99.